LATROBE, Pa. (AP) — Their All-Pro wide receiver spent the day welcoming newborn son Apollo into the world. Their talented but enigmatic project watched practice in a long-sleeved T-shirt and shorts waiting for the NFL to fully reinstate him after a year away from the game for running afoul of the league’s substance abuse policy. The guy with more receptions of 40-yards or more than anyone on the team last fall jogged around with his surgically repaired left knee wrapped in ice. Oh, and perhaps the NFL’s best running back remains in Miami, his pen yet to sign his franchise tender. And yet even without Antonio Brown, Martavis Bryant, Sammie Coates and Le’Veon Bell on Wednesday, the Pittsburgh Steelers and quarterback Ben Roethlisberger weren’t exactly lacking for options. There was veteran Justin Hunter — trying to catch on in Pittsburgh after splitting last season with Miami and Buffalo — using every inch of his 6-foot-4 frame to haul in a pass in the back of the end zone. There was Eli Rogers — a slot guy by trade — lining up on the outside and winning a 50/50 ball. There was 20-year-old rookie Juju Smith-Schuster — fresh off an ankle injury that forced the second-round pick to watch the opening few days of camp from the sideline – making a sliding grab one minute then showing off his blocking prowess for former Steeler wide receiver Hines Ward the next. Brown will slip back into his familiar No. 1 role when he returns. Bryant will be given every chance to show he can be the No. 2 provided he keeps taking all the necessary steps. After that, the picture is considerably blurry. And that’s a good thing for an offense that expects to be among the NFL’s most dynamic. Maybe that’s why Roethlisberger is even chattier than usual these days. The depth and diversity at wide receiver has never been greater in his 14-year career. So is the potential. “I want them to know what I see and I expect when we’re out there,” Roethlisberger said. Namely, production. Lots of it. Roethlisberger won’t lack for options, a sharp contrast to the makeshift group the Steelers took to New England in January. Bryant was suspended. Coates wasn’t anywhere close to 100 percent. Markus Wheaton was on injured reserve. Tight end Ladarius Green in sweats dealing with a concussion. In their place were seventh-round pick Demarcus Ayers and undrafted free agents Rogers and Cobi Hamilton. Hamilton provided Pittsburgh’s lone touchdown, a 30-yard rainbow to save a little face at the end of a 36-17 blowout. It was also a cap on Hamilton’s rise from a player who began 2016 on his couch to significant contributor on a division champion. Seven months later, Hamilton is well aware a job come early September is anything but assured. That’s the business. Brown, Bryant and Smith-Schuster’s spots are secure. Darrius Heyward-Bey remains one of the fastest players in the league and is a special teams ace. That leaves two spots at most to emerge from a cluttered group that includes Hunter, who has played for three teams over the course of the last two seasons searching for the right landing spot. Hunter has spent most of the opening week working with the starters while Bryant clears the league-mandated procedural hurdles required to end his winding path back to the team. The former second-round pick hasn’t wasted any time making an impression, making at least one highlight reel grab during every session. Hunter and Smith-Schuster give the Steelers some insurance in case of another misstep by Bryant, one that Bryant knows would likely end his career. 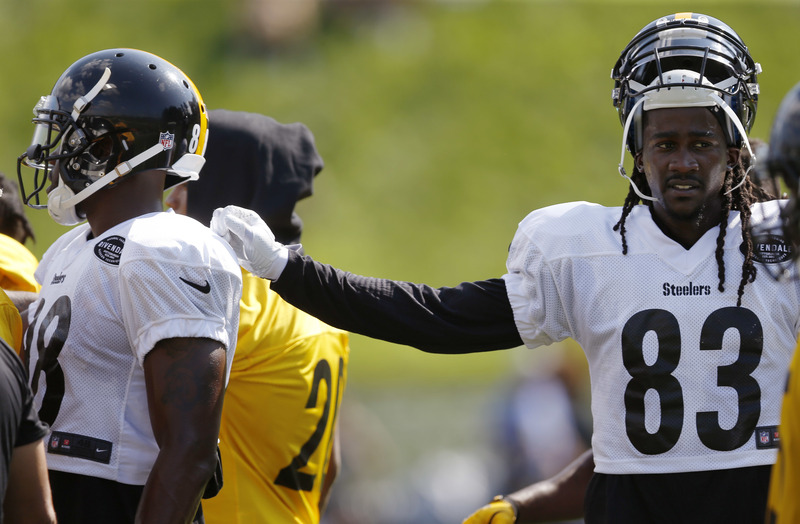 He and Roethlisberger sat down for a heart-to-heart recently to clear the air after Bryant took issue with the quarterback’s public admonishment of him following Bryant’s most recent suspension. Bryant’s absence, however, will provide Hunter, Smith-Schuster and everyone else an opportunity to get a long look. There’s no doubt Brown is the alpha dog. After that, it’s kind of wide open. While the receivers insist they’re not counting reps, when one of them gets going, the rest take notice.